ZEE’s Multi-Avatar Multi-Regional Campaign highlights the Diversity in the United Indian Family. ZEE Family pack with its 23 channels offers genres that fulfil the diverse entertainment needs of every family member.At a special launch offer of Rs. 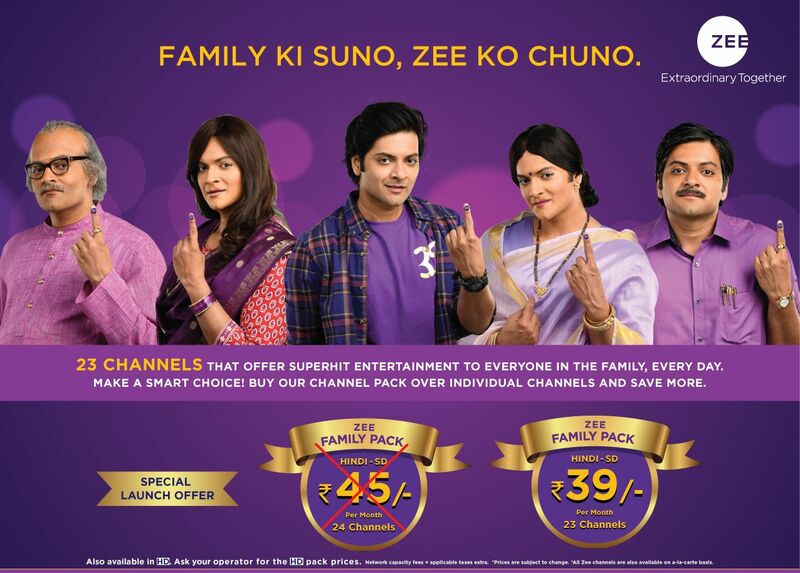 39* only buy Zee Family Packs instead of individual channels to save more. ZEE, the No. 1 television network in the country joins hands with Lowe Lintas to launch their quirky new multi avatar ad campaign featuring popular actors like Ali Fazal, Akhil Iyer, Siddharth Menon, Hitesh Mulkhani & Pradhuman Singh in different regional renditions.Taking the “Channels Ka Chunaav 2019” forward into door to door campaign mode, the new TVC effectively brings alive the diversity in demands of the United Indian Family with a clutter breaking multi- avatar visual representation. ZEE offers its viewers three very attractively priced packs ranging from the Zee Prime Pack Tamil-SD at Rs. 10* for 8 channels, Zee Family Pack – Hindi SD atRs. 39* for 23 channels to the ZEE All-in One SD pack that brings the entire lot of 26 channels at just Rs. 59* only. ZEE Family packs offer top daily viewing genres -Entertainment, Movies, News, Music and Lifestyle, that caters to every member of the family, every day. Bringing the best of regional channels, the ZEE packs are available in 11 languages – English, Hindi, Urdu, Marathi, Bengali, Oriya, Bhojpuri, Tamil, Telugu, Kannada and Malayalam.